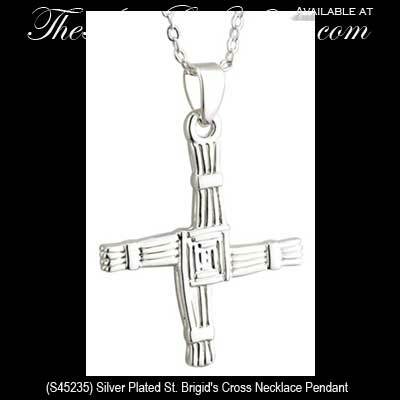 This St. Brigid's cross is a double sided necklace with a silver plated finish. Sorry this St. Brigid's necklace is now sold out. This St. Brigid's necklace, like all the Irish made jewelry at The Irish Gift House, is nickel free and hypoallergenic. This silver plated St. Brigid’s cross necklace measures 7/8" wide x 1 1/8” tall, including the jump ring and the chain bail. The St. Brigid’s cross pendant is a double sided design that includes an 18" long silver plated chain.